Get on the fast track to wellness and relaxation with a Velocity Spa™ - your own aqua masseuse. A Velocity Spa™ redefines the ultimate in personalized hydrotherapy with the exclusive Variable Velocity System™, which operates over 50 massage therapy jets. The Variable Velocity System™ responds to a simple push of the button delivering variable ranges of water movement at desired levels of intensity: from soothing caresses to intense and focused pressure. From head to toe, massage therapy jets are strategically positioned to stimulate blood circulation and joint mobility, relieve aches and pains, and reduce stress. 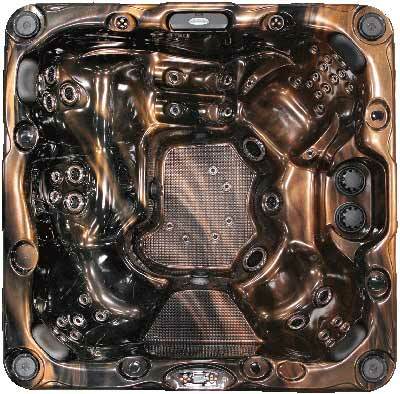 Velocity Spas™ are precision-engineered for maximum HIGH-drotherapy performance. Step-in to a Velocity Spa™ and feel exhilarated. Dimensions : 93" x 93" x 39½"